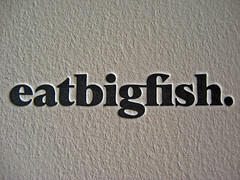 Good advice for any business: “Eat Big Fish”. 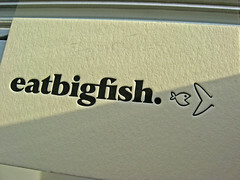 Eatbigfish is a consulting firm with a decidedly different approach. Their whole focus is based around a challenger mentality by helping companies challenge the accepted standard in their industry. 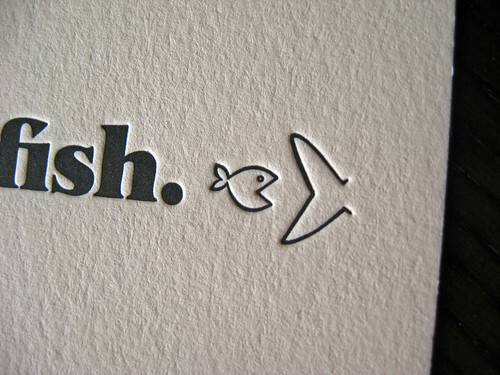 Almost every business faces competition and aiming for a higher standard is a great way to make your brand stand out! 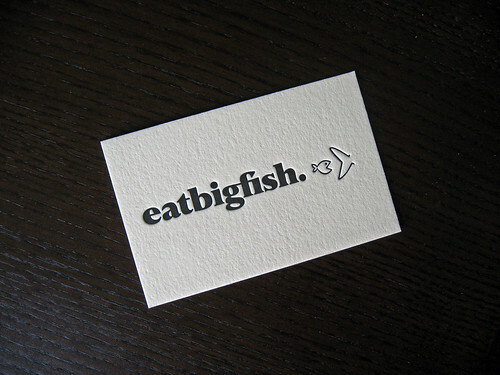 You can tell that the creatives behind eatbigfish definitely have a sense of humor … for more on that check out the back of their business cards after the break. 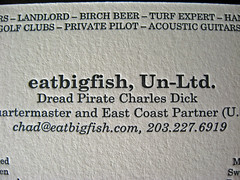 We were contacted by a member of the Eatbigfish team to print some business cards for them. 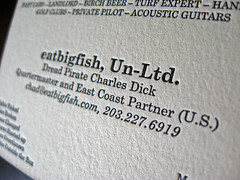 They supplied the design, a simple 1/1 letterpress business card. 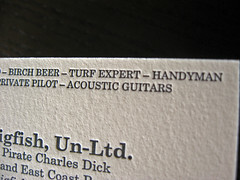 The logo was placed front and center on the business card which makes a bold statement. 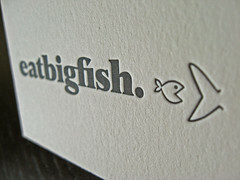 You know that you’ve got a great logo when people immediately know what your business is about. 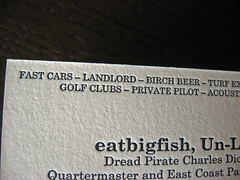 The business cards were letterpress printed on 220lb. Crane’s Lettra (Ecru White). 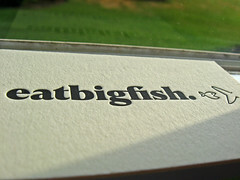 Both sides were printed in black, the backs were done first, and then the front to preserve a deep impression for their logo. 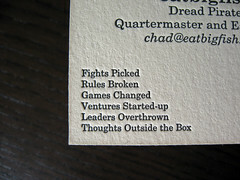 To ensure that the black on the fron of the card was bold, we double hit them (ran through the press twice). For a double hit to look right, the registration needs to be perfect unless you like your graphics and images to look blurry! 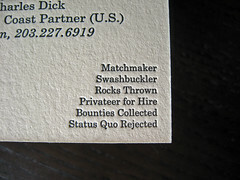 We’d have to say that these were the first cards we ever printed for swashbucklers! The backs are just as great as the fronts, especially because most people see all of the text before realizing all of the crazy stuff they actually wrote on it. 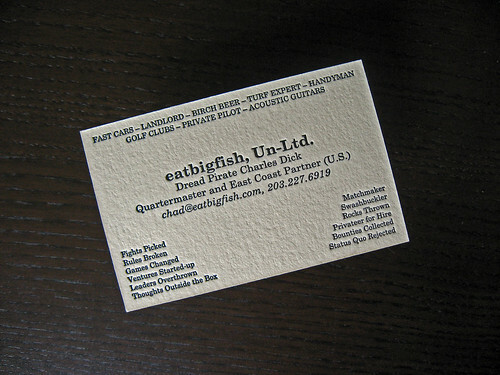 We printed these set of cards on our 8×12 C&P, hand-feeding is a great way to pass the time, we’re just happy to have a motor … treadling is so last century!